You agree to carry out an appropriate risk assessment to ensure that the site and buildings meet the requirements and safety needs of the group. Please do not let your group trespass on the golf course, it is private land and it is also dangerous. Do not cross or enter the stream. Do not let your group on to the land to the west of the site. This is private property. The archery area is out of bounds at all times unless participating in the archery activity. No smoking or naked lights in any of the buildings. Do not enter any buildings other than the group room and the main building (even if other doors are open). The disabled toilet and baby changing facilities are only to be used for its designated purpose. The kitchen and its facilities are free to use. Please leave it as you found it. All fire extinguishers are checked before each booking, a charge of £50 plus cleaning costs will be made for each fire extinguisher that is damaged or tampered with. If you are bringing any of your own electrical items, each item that supplies power will need to be PAT tested. If using outside contractors (bouncy castles, sound amplication, disco lights etc) they must have their own insurance. We will provide electrical points from within the buildings but it is your (or your contractor) responsibility to ensure adequate extension leads. If your group is found to have interfered in any way with the ropes courses and/or equipment you will be expelled from the site and incur a fine of up to £5000. 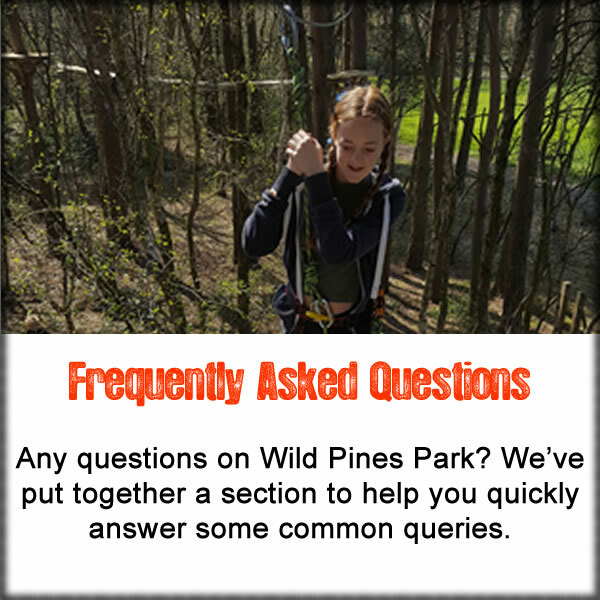 Injuries occurring from using the ropes course without express permission from Wild Pines Park Ltd are not covered in our insurance. The site is to be left as you found it. Do not damage the woodland. Damage must be reported as soon as it occurs. A charge will be made depending on the nature of the damage. If damage is not reported a bill will be sent for repair or replacement. This can include damage to the woodland (trees, damming of the stream), ropes courses, archery, orienteering facilities and all areas of the site. Wild Pines Park is a no smoking site. No dogs are allowed on site (except assistance dogs).